This recipe makes a generous amount. 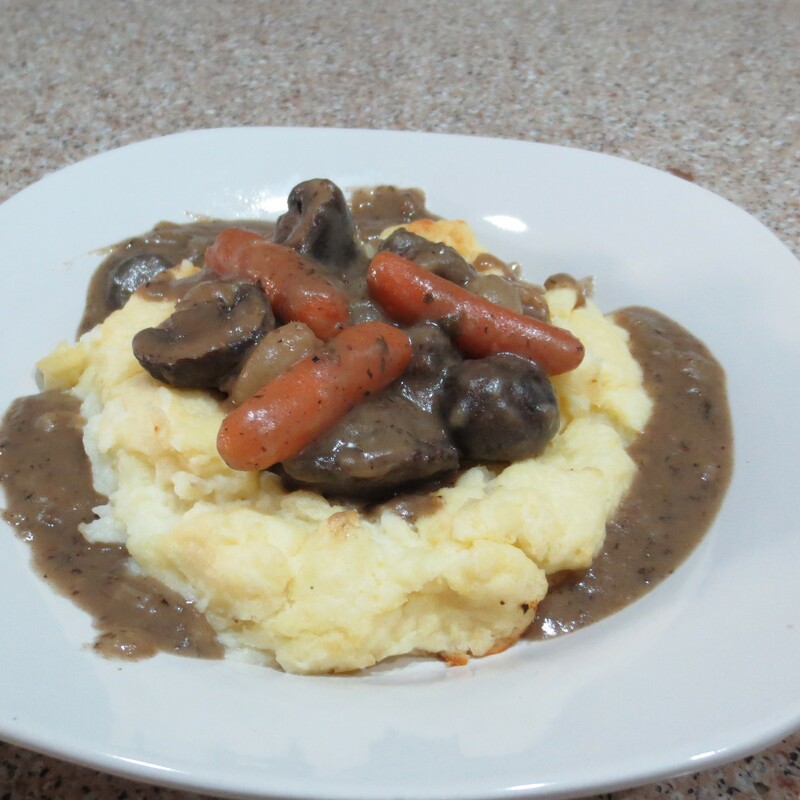 Unlike most stew recipes it contains no potatoes because this is served in Mashed Potato Bowls. If you like, parboil the onions and drain them before adding to the stew. This softens their flavor a bit. I adapted this recipe from one that was published in Southern Living Magazine years ago. 1. Combine the first 8 ingredients in a zip-top bag. Combine the wine and oil and pour over the meat mixture. Chill for one hour. Drain the meat well, reserving the marinade. 2. In a Dutch oven, fry the bacon until crisp. Remove the bacon, leaving the bacon drippings in the pan. Drain the bacon on paper towels, and set aside. Working in batches, brown the beef in the reserved drippings. Return the browned beef to pan and sprinkle with the flour. Cook, stirring constantly, 1 to 2 minutes. Add the reserved marinade and broth, then bring to a boil. Bake, covered, at 300* for one hour and 30 minutes or until the meat is tender. Add the carrots and onions and bake for another 30 minutes. 3. Brush the mushrooms clean and cut the large ones into quarters or halves. In a large skillet, melt the butter and add the mushrooms. Sauté the mushrooms until tender, then add them to beef mixture. Heat through. 4. Serve the stew in mashed potato bowls, sprinkled with the reserved bacon.